Some natural environments are more vulnerable to toxic effects of TEs. For instance, wetlands are geochemical endpoints of large river systems that often flow near or through cities, roads, factories, industries, cultivated lands, and/or mines, so they tend to accumulate considerable anthropogenic pollution. Vulnerable habitats like wetlands need to be closely monitored in order to assess the environmental health of these ecosystems. For this kind of monitoring we need reliable methods to measure TEs exposure, intake and bioaccumulation. To start the monitoring process we need to choose an indicator species. Choosing a species at the top of food chain is generally a good idea, since TEs concentrations tend to increase as they move up to the food chain. It’s best to non-invasively sample species – particularly if they’re endangered. Finding tissues which reveal medium- to long-term exposure of a TE rather than short term exposure tends to be a good idea too. In environmental monitoring we’re more interested screening for high concentration of a toxic TE due to chronic exposure as a consequence of pollution rather than as a consequence of punctual poisoning from the sampled animal’s last meal. We can only do this is if we have the right tissues. Keeping all of these factors in mind, bird feathers are a good organic matter to investigate TE exposure, intake and bioaccumulation. Many bird species are at the top or high up in the food chain and their feathers are easy to non-invasively sample, preserve and transport. The relatively slow growth rate of feathers, which is several weeks, means that they generally reveal a longer-term contamination process (compared to blood, for example, which represents a recent contamination directly associated with feeding). How to Assess Bioaccumulation of Trace Elements in Bird Feathers? Unfortunately, feathers have one strong drawback: they are constantly exposed to the external environment. 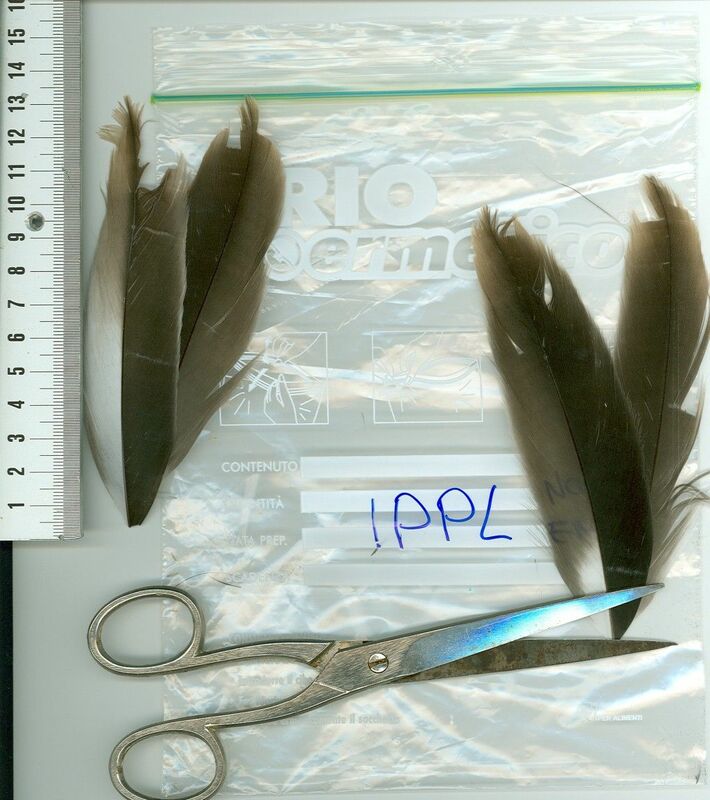 External contamination (ExCo) has frequently been used to challenge interpretations based on bird feathers. ExCo is the part of the concentration of TEs that isn’t from bioaccumulation in the keratin structure (i.e. TEs stored during feather growth as an effect of metabolic processes). Normally this is attributed to atmospheric dust, water or contaminants added to the feathers during preening (Dmowski 1999; Dauwe et al. 2002; Jaspers et al. 2004). Most of the previous field studies have tried to remove ExCo through washing; but, to date no washing procedure has been completely effective in ensuring the total removal of ExCo from feathers. If we want to use feathers as indicators of bioaccumulation of trace elements, then we need to reduce the relevance of ExCo. Only use shafts for analysis. Feathers without vanes capture dirt less efficiently, so they have less ExCo. Sample unfledged chicks of colonial species. Chicks from these species have sediment particles of proven origin entangled in their plumage (because they have not flown to other environments). This measure also has the added benefit of controlling for variability due to age. Use local geochemical information from sediments collected around nesting areas. This allows us to compare the local geochemical fingerprint to the element ratios in feathers. Choose an extensive set of elements, including some of which are supposed to be negligibly accumulated in feathers. These are useful to check for ExCo in the investigated sites as they are indicators of clays (e.g. aluminium (Al) and lanthanum (La)) and other fine fractions of the sediment such as oxides and hydroxides (e.g. iron (Fe)), and salt (e.g. potassium (K)). By doing this we can correct the analytical result for ExCo by comparing sediment and feather concentrations of trace elements and metals. is mostly in feathers due to ExCo. We adapted the above methods using feather samples from greater flamingos from three Mediterranean sites. The greater flamingo is a colonial species with a widespread distribution and are the largest biomass of Mediterranean wetlands. They mainly feed on small benthonic invertebrates by filtering sediments of brackish wetlands and saltpans. During feeding, they can ingest a lot of sediment containing organic matter which is digested as a component of diet. 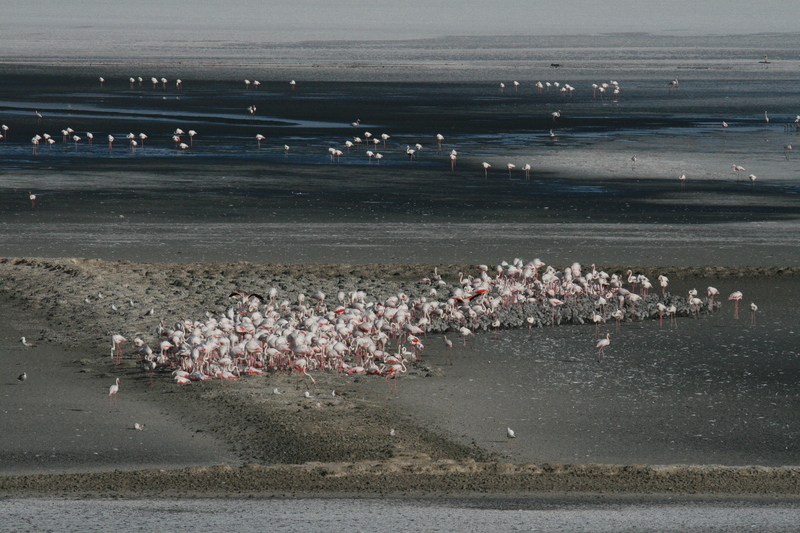 Their particular feeding behaviour leads flamingos to be directly exposed to polluted sediments. In addition, flamingos feed their chicks with a liquid secreted from the upper digestive tract, rich in proteins, fat, carotenoids and blood cells and, as a consequence, with previously bioaccumulated and metabolized pollutants. All of these reasons make greater flamingo chicks a good choice among birds as an environmental indicator of the effect of TE bioaccumulation in Mediterranean wetlands. Greater flamingo colony in Fuente de Piedra southern Spain. 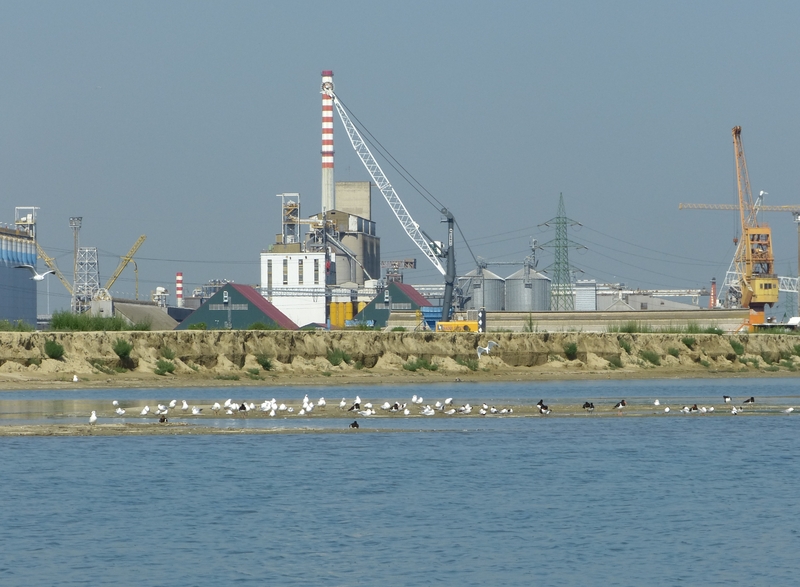 Chicks were sampled from three major breeding colonies in the western Mediterranean: Aigues-Mortes in southern France (n = 39), and Fuente de Piedra, (n = 40) and Marismas del Odiel (n = 40) both in southern Spain. We found that the washing procedure removed >99% of potassium indicating that most of the ExCo from salt was removed. However scanning electron microscopy and mass spectrometry revealed that some sediment particles remained after washing, especially clays which are likely to severely bias bioaccumulation interpretation. So we chose iron as a reference element. Iron was used as a reference because it is well recovered by the methods applied in our study, it is reported to be only negligibly bioaccumulated in shafts of seabirds (Howell et al. 2012) and it represents a wide gamma of compounds in sediments. As a consequence of the application of this simple method, we validated conservative estimates of bioaccumulation for arsenic (As), cadmium (Cd), chromium (Cr), copper (Cu), mercury (Hg), nickel (Ni), lead (Pb), selenium (Se), tin (Sn) and zinc (Zn). Without careful consideration of ExCo, conclusions about the validity of the concentration of element bioaccumulation in feathers, and consequently ecological interpretation are unreliable. Our new method is a more reliable way of analysing trace element concentrations in feather shafts which effectively controls for ExCo. While iron was used in greater flamingos as the reference element to infer ExCo in feathers, a different reference may be used in other studies depending on sampled species and environmental characteristics (in other words the predicted main source of external contamination and the pollutants which are the object of the research). Our study focused on feathers, but a similar strategy can easily be applied to other non-invasive organic samples when residual soil/sediment particles may bias interpretation of bioaccumulation (e.g. when assessing trace elements in plants, invertebrates, eggshells, faeces and hair samples of vertebrates). To find out more, read our Methods in Ecology and Evolution article ‘Assessing environmental pollution in birds: a new methodological approach for interpreting bioaccumulation of trace elements in feather shafts using geochemical sediment data’. This entry was posted in Conservation and management, Methods papers and tagged Bioaccumulation, Birds, External Contamination, Feathers, Flamingos, Heavy Metals, Ornithology, Pollution, Trace Elements, Wetlands, World Wetlands Day by Chris Grieves. Bookmark the permalink.